Mocking Muslim Victims of Grenfell Tower Fire? Blame the Media! Published by CJ Werleman Independent, a crowdfunded and independent investigative journalism project that seeks to expose and end injustices against Muslims around the world. Please SUPPORT his fight against injustice and the Islamophobia Industry by clicking HERE. In this age of far-right hate, it’s almost impossible to be truly shocked about anything anymore, whether it be US President Trump racially vilifying the world’s most vulnerable people, refugees, or thousands of neo-Nazis proudly marching in the streets of US and European cities, or the terrifying rise of openly far-right fascist movements and political figures. But a video posted online on Sunday evening (GMT) not only shocked me to my core, but also captures the way in which genocidal hatred of Muslims and racial minorities has moved from the darkest corners of our societies to the center of mainstream political discourse, and in doing so demonstrating how toxic and unwell our supposedly liberal Western democracies have become. 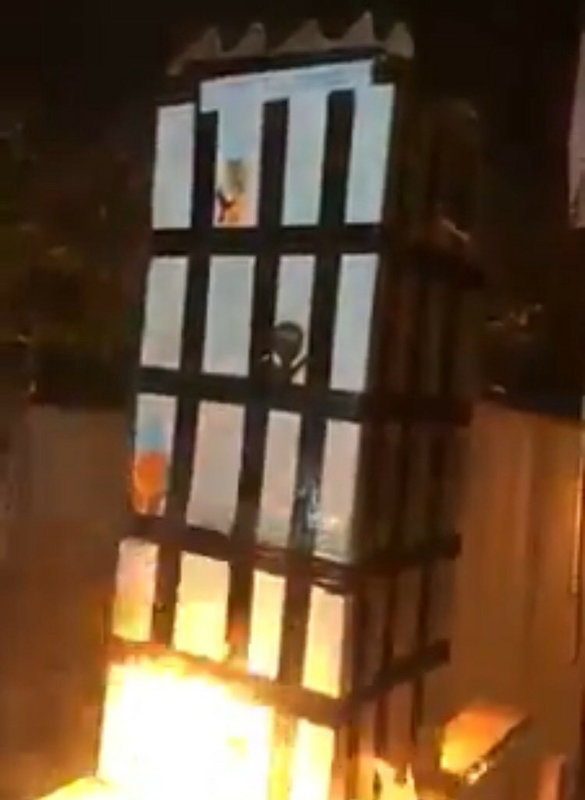 The video in question shows a group of white British men setting fire to a detailed cardboard model of the Grenfell Tower, London, in which 72 Britons, most of whom were Muslim, were burned to death in a fire that enveloped the building on 14 June, 2017, making it the worst residential fire since Nazi warplanes dropped bombs on the city during the Second World War. It’s unclear who shot the video, and who exactly are the perpetrators of this unconscionable effort to incite violence against Britain’s 4 million Muslims, but experts in linguistics claim their accents suggest they’re from Essex or London, and London police are investigating their identities. “I was there that night, I was covered in ash, saw people die. I still live meters away now — I’ve seen a lot of disgusting behavior towards residents, survivors and bereaved but nothing has disgusted me like this has. The last funeral was only a few weeks ago,” Celeste Thomas, an eyewitness to the fire, told me. How on earth did we get to this point whereby some could imagine mocking the burning deaths of British Muslims is funny, reasonable, or acceptable behavior? It’s not only positively unacceptable, it demonstrates a state of mind, or even a collective conscience among large swathes of the public that could or would make genocide possible or even probable. Dehumanization of Muslims in British society has followed an all too predictable trajectory: it starts with mocking Muslims and the tenets of their faith; it moves to mocking the tragic deaths of Muslims by setting fire to a box; and it ends with eventually putting actual human beings in an actual box or cage, the same way Nazi Germany dispensed with 6 million Jews during the Holocaust. Worryingly, the video shows what are presumably ordinary but proud British citizens, a presumption made only by the sight of the flag of Saint George’s cross in the background, but this is where we are today: normal and ordinarily well meaning people doing otherwise uncharacteristically bad things out of fear and animosity towards Muslims. The hatred the people in this video have in their hearts for Muslims presumably comes from a diet of anti-Muslim tropes that the British media has only been too happy to spoon feed the British public in return for website page clicks, newspaper subscriptions, and advertising dollars. For years, British newspapers have been guilty of publishing misleading headlines that falsely smear Muslims. For instance, the respective Daily Sun headlines, “UK Mosques Fundraising for Terror,” “1 in 5 British Muslims Express Sympathy for Jihadis,” and “Muslims Are Silent on Terror” were all found by an independent media watchdog to be false and misleading, while other news outlets have been identified as spreading fear of Muslims with headlines such as, “BBC puts Muslims before you” (Daily Star); “Halal secret of Pizza Express” (The Sun); “Muslim vote could decide 25 per cent of seats” (Daily Mail). Even more disturbingly, the media’s blatant effort to capitalize on the public’s increasing animus towards Muslims is being helped along by a political class that views Islamophobia as avenue to securing votes. One only has to look at the former British Foreign Secretary Boris Johnson’s recent comparison of niqab wearing Muslim women to “letterboxes” in order to observe this reality. It doesn’t take a degree in counterterrorism or counter-radicalization to know that hate crimes in the streets follow the tone set by politicians and pundits in the media, thus unsurprisingly the UK Home Office reported a 40 percent increase in religious hate crimes in 2017, with more than half of these attacks targeted at Muslims. A recent report also described a “worsening environment of Islamophobia” in which Muslims are confronted with a “new and acceptable hostility in many spheres of everyday life,” experiencing attacks on their places of worship, threats, acts of intimidation, verbal abuse and physical attacks. And now we have a video showing a group of Britons mocking the fiery deaths of dozens of Muslims in London. We now know how we got to this point. The question now is what comes next?